Singapore-listed Trendlines Group today named its colostomy-device company, Stimatix GI Ltd, as the company referred to in its financial statements and other reports as its “Most Valuable Portfolio Company”. Stimatix has developed a "cap" that sits over the opening in the abdominal wall of a patient who has undergone colostomy. It looks like a bandage as it's skin color and flat. When the person feels pressure building up behind it, he goes to a bathroom, removes the cover and a bag folded up inside comes out. It is removed and disposed of with faecal matter, and a new one is put on.In November 2014, Stimatix sold its assets to a subsidiary of the B. Braun Group -- B. Braun Medical SAS, which hosts the Stomacare Center of Excellence. B. Braun is one of the world's leading providers and manufacturers of healthcare solutions. B. Braun has advised Trendlines that it plans to market the product internationally from mid-2018. After a part of the colon has been removed due to a disease such as cancer, a small bag is connected to an opening in the abdomen to collect waste. Patient wears it at all times, resulting in a disrupted lifestyle. There is discomfort, and sometimes infection and sores. Faecal waste moves automatically into the bag, which must be removed and cleaned. 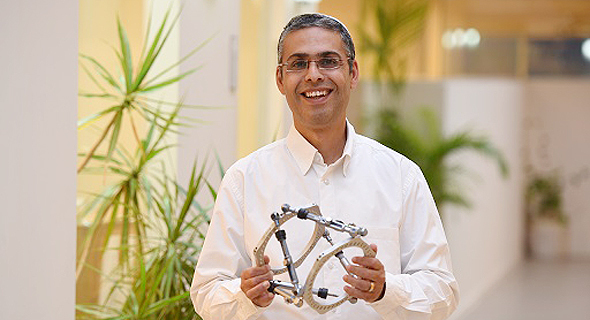 The 2014 Asset Purchase Agreement included a non-disclosure clause; now that the product is coming to market, B. Braun has authorized disclosure by Trendlines, a leading Israeli investment and innovation commercialization company, focused on early-stage, high growth innovation-based medical and agricultural technologies. Trendlines currently maintains a 28.2% holding in Stimatix. As of the last valuation dated 31 December 2017, the fair value of Trendlines’ Stimatix holding was US$42.6 million. Due to the significant value of Stimatix in the Trendlines portfolio, the valuation of Stimatix is set by an independent firm that specializes in the medical device industry. The US$42.6 million valuation represents the projected net present value of Trendlines’ share of the estimated future royalty payments from the sale of the company’s product, after adjusting the cash flow to take account of multiple risk factors including market risk, manufacturing risk, and product risk, and then applying a financial discount rate. Further details on the valuation can be found in “Notes to the Financial Statements”, Note 8 B, page 116 of the Group’s audited financial statements for the financial year ended 31 December 2017. B. Braun is currently in the process of completing a high-volume manufacturing facility and the product launch is on schedule for mid-2018. The worldwide stoma/ostomy care market is estimated to reach US$2.99 billion by 2022. B. Braun plans to sell Stimatix’s ostomy products worldwide. The acquisition transaction included a cash payment at closing, milestone payments, and royalties from future sales of Stimatix’s products, as described in Note 8B of the Group’s audited financial statements for the financial year ended 31 December 2017. In addition to a dividend which was received subsequent to the initial closing in November 2014, Trendlines Incubators Israel Ltd., the Group’s wholly-owned subsidiary, has been paid approximately US$1.6 million in dividends, to date, upon Stimatix’s completion of the relevant milestones. B. Braun is to make royalty payments to Stimatix based on product sales. While at the discretion of the board of directors of Stimatix, royalties so received are generally expected to be distributed to Stimatix’ shareholders, including Trendlines Incubators Israel Ltd., as dividends. As announced on 30 October 2017, Trendlines intends that dividends will be paid from the Company's annual distributable after-tax profits, if any, out of net cash proceeds received, including distribution from Stimatix’s royalties received by Trendlines at a payout ratio of 90%, subject to certain conditions under the Israeli Companies Law. Trendlines will determine if any dividends are to be paid following completion of the Company’s audit for the financial year ended 31 December 2018. Steve Rhodes, Chairman & CEO of Trendlines Group. NextInsight file photo.Steve Rhodes, Chairman and CEO of Trendlines said, “Not only is this asset sale of significant financial benefit to Trendlines, but it marked the launch of our partnership with B. Braun – now one of our major international partners in multiple facets of our activities, including as a cornerstone investor in the Trendlines 2015 IPO and, again, participating fully in our 2017 share placement. "B. Braun has also invested in other Trendlines’ portfolio companies, and is our co-founder and investor in Trendlines Medical Singapore Pte. Ltd.
“Additionally, we are really proud of Stimatix’s entire team. Stimatix developed a product to improve the quality of life for individuals receiving ostomy care, as well as to revolutionize the entire industry, which hasn’t seen significant advancement in care in almost 60 years. Stimatix is a great example of a company that fulfills the Trendlines’ mission of creating and developing companies to improve the human condition."